What The Hell Is Happening With IndyCar's Brakes? If there’s been a consistent theme with Brembo brakes on single-seaters this year, it’s been “not good.” During today’s Verizon IndyCar Series season opener, Spencer Pigot’s brakes exploded on lap 26. When brake problems appeared in testing, caliper supplier Brembo pointed the finger right back at IndyCar. What on earth is going on? Pigot’s left rear brakes blew up while he was running in fifth place, lighting his tire on fire and forcing his team to replace a whole bunch of kit on his car. This is the worst. IndyCar is a breath of fresh air for racing fans in a year when NASCAR has gone full-gimmick with their race format, and the last thing fans want to see are drivers taken out by mechanical failures. Teams have been struggling with Brembo brake calipers overheating all throughout testing, a problem which Racer believes to be caused by the series’ move to using Performance Friction Corporation pads and rotors while using Brembo’s brake calipers. IndyCar made a deal with a new brake supplier that isn’t Brembo, so they’re phasing in some of PFC’s components this year. It doesn’t seem to be working, as PFC’s components generate more heat than the Brembo calipers are apparently designed for. 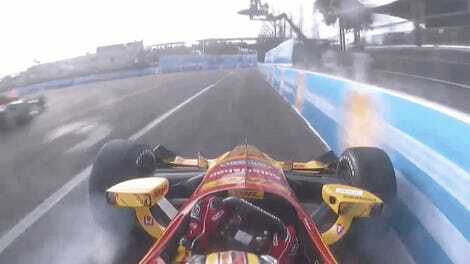 Earlier today, Ryan Hunter-Reay had a terrifying rear brake failure that sent him into the wall, although Hunter-Reay didn’t believe it was related to the overheating issue. 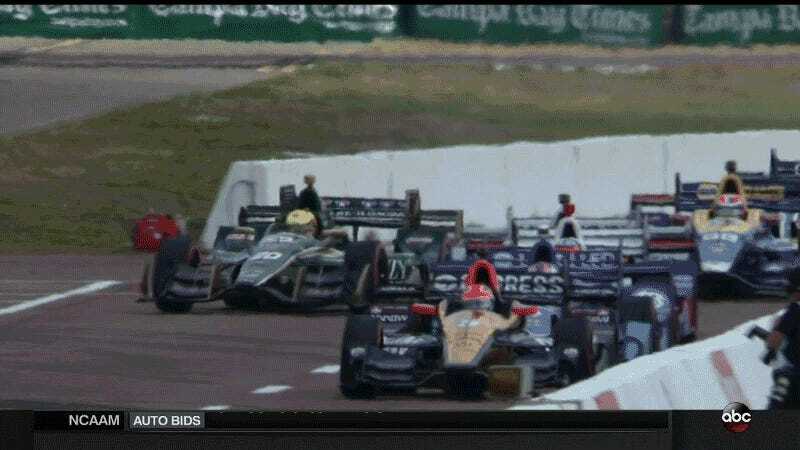 Pigot’s crash, however, definitely looks to be the definitive hot brake mess of the moment. For the year 2017, Brembo has not been asked to attend, contribute or participate in Indycar Series brake development (rotors, pads and bells), as Indycar, PFC and the Competitors have elected to assume such responsibility. We have no way of establishing whether there are any issues with Brembo calipers being used by IndyCar competitors as the most recent, and only, brake test Brembo attended was in Road America in the summer of 2016. From that test there was no evidence of issues with the use of Brembo calipers with PFC brake components. This doesn’t sound good, either! It’s one thing to get a new brake supplier. It’s a serious problem to shut out the previous partner when you’re still using their kit. Brembo’s release on the issue even refers to overheating as an “alleged” problem, as it’s very clear they’re making it out to be IndyCar shooting themselves in the foot, given the mix of components and Brembo’s inability to give the series any guidance. Brembo would like to remind you that our calipers are specified products that have been supplied to the Series since 2011, and in accordance to the Rules and our Agreement with IndyCar, have not been modified nor has further development been undertaken. Brembo has supplied each competitor with a Technical Bulletin covering all performance and safety topics of our product. Brembo also issued a Technical Bulletin for the IndyCar Series where maximum running temperature of 210°C was specified, in conformity with the signed Supply Contract with IndyCar. We recommend that each competitor operate Brembo calipers within the defined specifications. Reliability is not guaranteed outside these specifications and the magnitude of the deviation may result in extremely dangerous conditions. IndyCar did not comment on the brake issue to Racer, however, Jalopnik has reached out for comment and will update this post if we receive a response. Of course, there very well could be an issue with the Brembo calipers themselves. In Formula One, the Haas F1 team has struggled with their Brembo brakes all throughout 2016, and those issues with brake feel and performance weren’t any better during preseason testing. Haas driver Romain Grosjean recently remarked to Motorsport.com that he “can’t wait to get back to something different” when it comes to solving the issue, and the team recently tested out Carbone Industrie brakes as a possible solution. Who’s right, then? It’s hard to say. Regardless, we hope someone figures it out before we see another car fly into the wall. UPDATE: An IndyCar representative who responded to our inquiry on the matter said that it’s up to the teams to adapt to the new brake package for 2016, and that some teams who either have not had or are no longer having problems with their brakes have adapted to the new kit better than others. The series believes there is nothing wrong with the combination of Brembo calipers with PFC brakes and rotors, but they will continue to work to ensure it’s an optimal, properly functioning brake package. IndyCar also confirmed that Hunter-Reay’s brake failure had nothing to do with this issue, as it was determined to be caused by a broken bleeder valve. However, an investigation into what happened with Pigot’s car during the race is ongoing.